Gene Kelly The Basics: Did Gene Kelly Attend Judy Garland's Funeral? Did Gene Kelly Attend Judy Garland's Funeral? This post is part of the series Gene Kelly: The Basics, which addresses fundamental questions fans often ask about the star. Judy Garland died at the age of 47 of a barbiturate overdose. Her funeral took place in New York City on June 27, 1969. ​But Gene Kelly—Garland's co-star in For Me and My Gal, The Pirate, and Summer Stock—was not there, it appears. Based on the widely circulated account of Garland's funeral (see above image), Kelly—along with Grace Kelly and Louis Armstrong—sent his condolences via telegram. In Los Angeles, he was putting the final touches on Hello Dolly!, which premiered in December 1969 (filming apparently ended the previous summer). At the same time, he was readying production for Cheyenne Social Club, which began shooting in L.A. and Santa Fe, New Mexico, in early July 1969. ​In 2017, Garland's remains were moved from New York to Los Angeles for, the AV Club reports, "a surprisingly sweet reason." 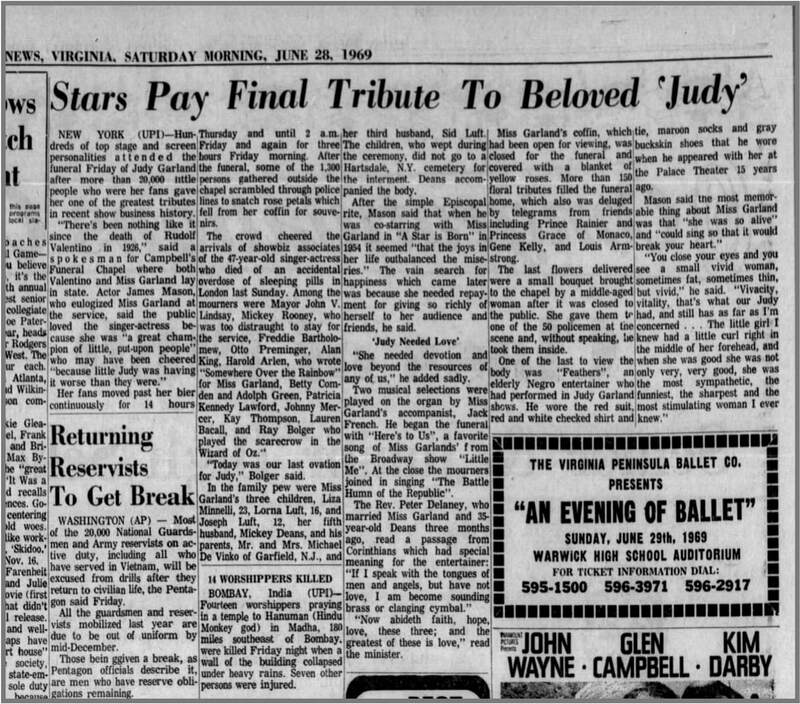 "Stars Pay Tribute to Beloved Judy." Daily Press (Newport News, Virginia), 28 Jun 1969. Van Gelder, Lawrence. "Judy Garland's Funeral Draws Her Colleagues." NY Times, 28 Jun, 1969.